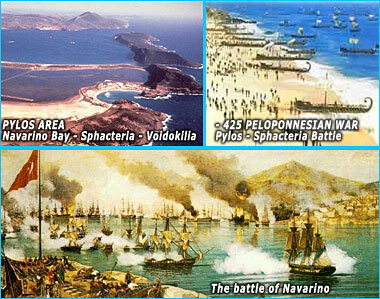 Facing with Pylos city and closing Navarino Bay, the island of Sphacteria (also called Sphagia) is a huge natural barrier against the strong winds in the Ionian Sea and thus protects the Gulf of Pylos. Only two narrow passages permit access in to the bay: - in the south "the Great Thouri pass" (near the city Pylos) - in the north, the "Sykia pass" (facing the Koryphasion promontory Koryphasion, near Voidokilia bay). This rocky barrier is made up of many islands, which are ranked as follows: - from the southern entrance of the bay, initialy you found Tsichli-Baba island (also called Pylos islet) with a huge arch, then the Koutsounes both rocks; just after, follows in alignment, the main island Sphacteria to cliffs falling precipitously into the sea (she measuring 4.6 km. long and about 135 meters wide). 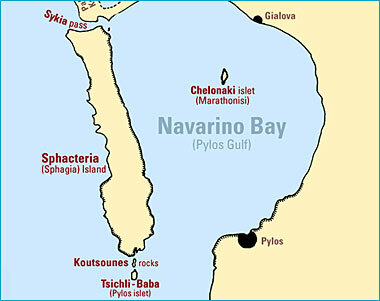 At the center of the Bay of Navarino is the island of Marathonisi or Chelonaki (which in Greek means small turtle). During the summer, a day excursion with caïque or motor boat on the Sphacteria island is organized leaving the harbour of Pylos (inquire on the spot). It allows not only to admire the beauty of the islets and the main island, but also to visit the memories and monuments of naval Navarino battle and a few wrecks of ships sunk during the battle in 1827.